At River Oaks School of Dancing, we offer a variety of dance lessons in Houston to work with every skill level. We have a true passion for the art of dance and strive to ignite that same passion in our students. We can help you transform into a strong, confident dancer with our programs. Private dance lessons allow you to work one-on-one with your instructor at your own pace. Whether you’re a more experienced dancer or are just getting started, our instructors can help you achieve your dance goals with grace and style. Group dance classes are a great way to break into the world of dance casually while having a lot of fun. Participants of any skill level can join the group dance lessons at River Oaks School of Dancing. You’ll get to know other dancers and people with the same passion and zest for life as you. The first dance at your wedding is an exhilarating and nerve-wracking experience. Your wedding videographer will capture every moment, and there’s a good chance it could end up on social media too. You want to make sure your first dance is perfect, and our instructors can help. 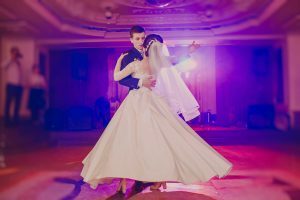 Not only do we choreograph and teach you a dance appropriate for your skill level, but we also give you tips on how to control the first dance jitters and wow your wedding guests. Dance practice parties are a great way for you to show off the moves you’ve learned during private or group dance lessons. Have a blast dancing with students and teachers alike, pick up a few pointers, and most of all, enjoy yourself in a fun and relaxed environment. This is the perfect way for people who are perhaps a little nervous about dancing in front of others to get started. If you’ve got a competitive spirit, you’re right at home. 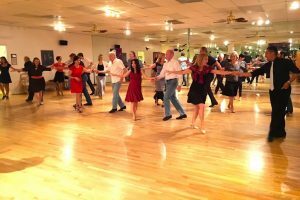 River Oaks School of Dancing is a World Dancesport Series Top Ranked Studio in Texas, and our instructors can help you sharpen your moves and take your passion for dance to the next level. Are you ready to put your dance moves on display? Our showcases are a great opportunity for you to invite your family and friends to see the hard work you’ve put into learning the art of dance. Showcases help you shine!